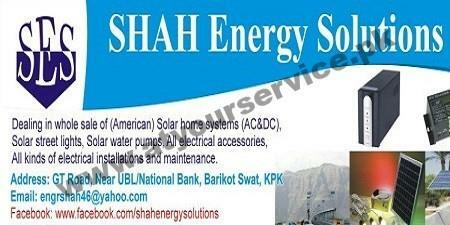 Shah Energy Solutions is located on GT Road, Barikot, Swat. It is a distributor of products of Shaan Tech Energy Solution Karachi. It deals in wholesale of solar systems, solar street lights, solar water pumps and electrical accessories. It also provides installation and repair/maintenance services for all kind of electrical equipment.